An elegant and precisely detailed Italianate house of excellent integrity and of interest as the residence of architect John Flannagan. Bowen Street, Egan Street, Erin Street, Freeman Street, Highett Street, Hoddle Street, Kingston Place, Leeds Street, Lennox Street, Moorhouse Street, Muir Street, Normanby Place. Opposite Yalcowinna, on the north side of Erin Street, a pair of semi-detached houses was built in the 1850s-1860s. One was owned by the pioneer Presbyterian the Rev. Dr Adam Cairns and the other by merchant William Muir (see Muir St). R W Wrede immediately sold his 1839 allotment to James Hodgson (one of the first members of the Legislative Assembly). (140)By 1855 it had been subdivided into the present street layouts. (141) There were two houses on the south side of Highett Street at this time, set back from the street with formal gardens, as are the existing houses. The Edwardian-era houses at 44 and 46 Highett Street have early wings at the rear as an indication of this earlier phase. In 1889 the mansion Yooralbyn (29 Erin St, later renamed Elim) was built for merchant William Harper (see HO257). Further subdivision occurred on the north side of Erin Street in the 1870s and the south side was subdivided in the early 1880s. In the 1880s the mansion Millew was built for Robert Hoddle's widow near to Yalcowinna. This was leased by the Salvation Army in 1903 as the Bethesda hospital, then purchased and extended by them in 1912. 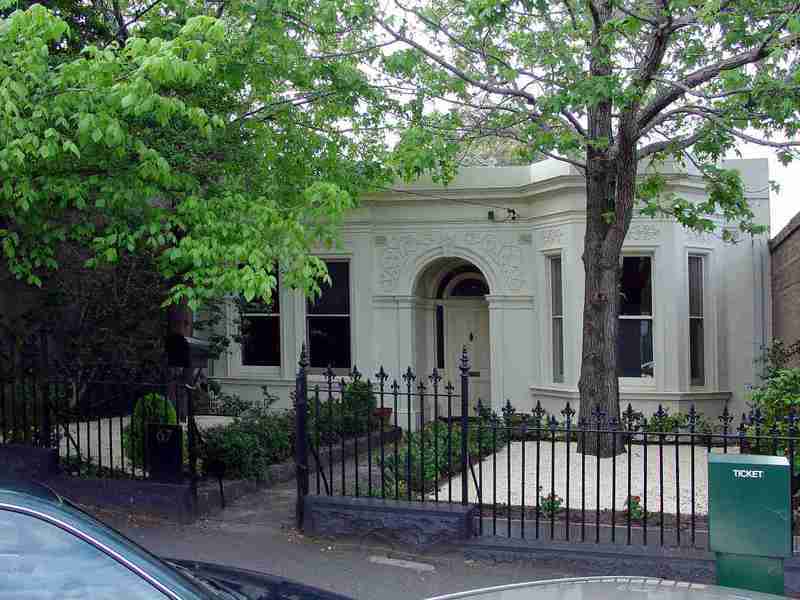 On the south corner of Erin and Hoddle Streets is the unusual Urbrae (171 Hoddle Street, on the Victorian Heritage Register), the combined mansion houses of Dr. Tom Boyd and Dr. William Boyd. By the late 1890s the MMBW Detail Plans showed most of the area developed as residential, with the accumulation of private subdivisions (and the later imposition of the railway) yielding irregular street layouts and lot sizes. Small attached and detached verandahed houses, set close to the street, were located in short streets such as Moorhouse, Muir and Normanby, with larger detached houses and gardens in the wider, more elevated streets like Erin St. Larger houses, both attached and detached, were shown in longer east-west streets such as Egan and Highett but the latter had larger gardens and street setbacks. One distinctive aspect of Highett St is a stepped side lane that runs off the street up the hill to the south, an element more typical of inner Sydney suburbs. Street furniture such as gas lamps, pitched crossings, asphalted footpaths and street crossings were shown, along with telegraph poles shown in Lennox and Erin Streets (142). No street trees were shown. The railway linking Melbourne to Clifton Hill opened in 1901, with the West Richmond Station built across the western end of Highett Street. Traffic was diverted to Hoddle Street via Muir Street and Freeman Street. The main development period evident in the West Richmond Heritage Overlay Area is that of the Victorian era with a contribution from the Edwardian-period. There is also a contribution from some well preserved inter-war buildings and individually significant places of all eras.
. The West Richmond Railway Station, landscape and associated trackand tunnel.
. For the many houses originally occupied by eminent Victorians.
. For the many individually significant buildings in the area including well preserved inter-war examples like the Moderne style flats at 151 Hoddle Street.